Making infused vinegar is really fun…you can experiment with ingredients you have around the house to make lively tasting and beautiful creations. Let your imagination run wild and play around with different flavour combinations to suit your palate. now, you still left with a pretty full bottle…we recommend you use it to flavour your pickling brine ~ it is sure to add great flavor with some heat to dill pickles, pickled cauliflower, or anything else you choose. Place bottles in the oven to sterilize at 250F for 20 minutes. Measure bamboo skewers against your bottles ~ the skewers should be about 3/4 as long as the bottles. Trim a little bit off each skewer if necessary. For each jar soak 1 bamboo skewer in water. 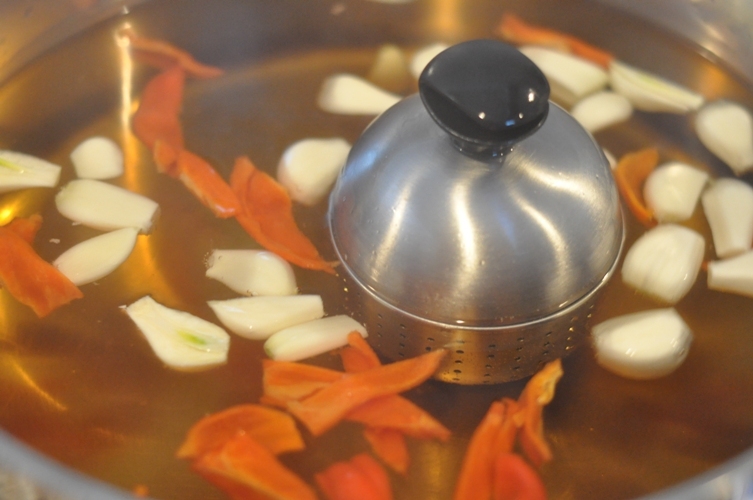 Heat cider vinegar in a non-reactive saucepan just to a simmer. Meanwhile peel and quarter onions, seed and cut habenaros, peel and mince garlic, and using a fruit peeler remove the zest from the orange and cut into thin ribbons or strips about 1/8″ wide. Place cut onions and minced garlic into a spice ball. Remove heated vinegar and add habenaros, garlic cloves, and spice ball. Let cool slightly. Divide the onions and minced garlic placing equal amounts into each sterilized jar. 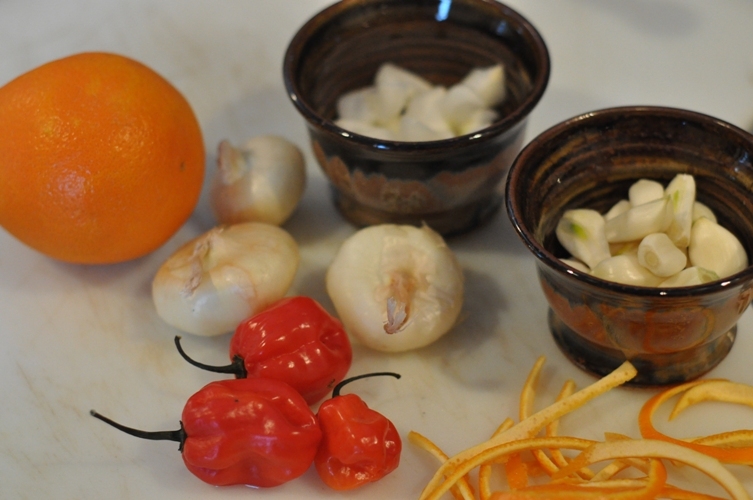 Carefully thread the garlic cloves and Habanero strips onto the skewer alternating between the two. 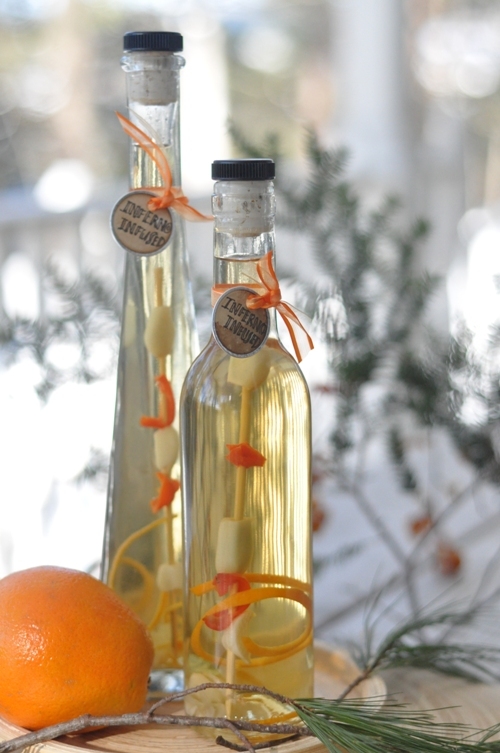 Place the skewer wrapped in an orange ribbon into each bottle. Using a funnel, pour the vinegar into the bottle, ensuring that all the ingredients are covered. Cap or seal with a cork. Let steep 2 to 3 weeks before using. This vinegar should be used within 3 to 4 months once the bottle has been opened. Remove and discard the skewer as the ingredients become exposed. If you are not making this to give away then you may consider reducing the recipe as this stuff is INFERNO HOT or putting it in smaller bottles. And, if you are giving it away you may want to write some kind of disclaimer. Just an idea.